The middle-aged nurse came in shortly before 3pm with an electric razor. I dropped my pajama pants and the artist went to work, removing all evidence of puberty below the waist. This was a necessary precaution, she explained, as bacteria can easily stick to hair follicles, leading to an infection. Plus, they would need to tape my entire groin area after the procedure, which would cause a lot less pain and friction if taped to a smooth, hairless surface. Still, it was much better than my last operation, where the nurses shaved me from my neck to my knees. The following day, a Thursday, I was scheduled for an early morning procedure to stop the bleeding in my lungs. Around 8:45 in the morning, the pre-op preparations commenced. The on-duty nurse entered my room with a variety of instruments, one of which she referred to as a “balloon”. Upon closer inquiry, I realized to my utter shock and horror that she was about to insert a Foley catheter into my manhood. I tried to reason with her, even convincing her I could hold my urine for the entire duration of the operation. As the tube came closer, I braced my body for impact. Kanako looked on with horror as screams of suffering echoed throughout the room. The tube seemed to be several kilometers in length. I felt as if I was being belated on a multi-pitch climb: the catheter inched its way into my bladder in agonizing stages. By the time the tube came to a complete halt, my cheeks were filled with tears and I truly thought my baby-making days were ruined forever. Next came the IV in the right arm, which was a piece of cake compared to the tube dangling below me. At 9:20am three of the strongest nurses invaded the room, picked me up, and put me on the gurney for transport to the operating room. 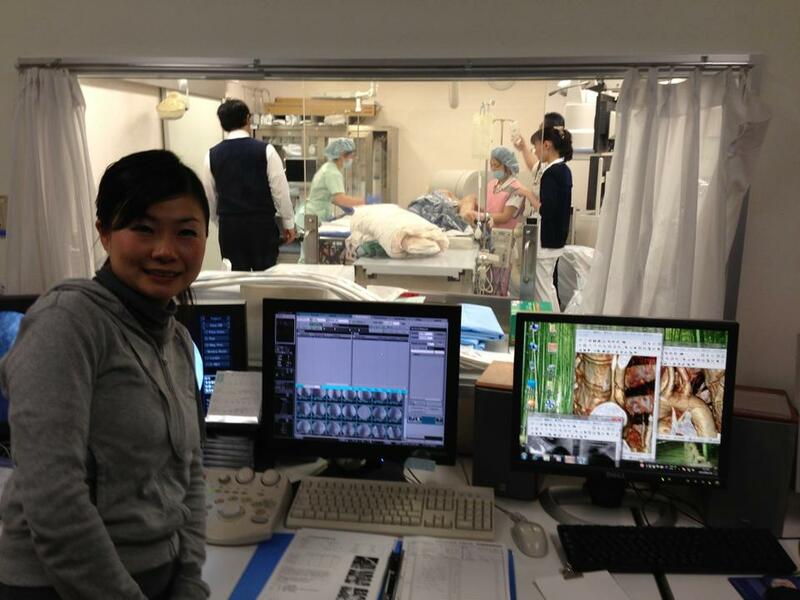 Dr. Ishikawa greeted me with ease and started the preparations for the surgical task. The room itself was set up a bit like a recording studio. On the far side of the space there was a rectangular glass window that ran the length of the room. Behind this partition, two doctors looked on and gave instructions to my surgeon. Kanako was also allowed to set in mission control and overlook the proceedings. To my immediate right was a small computer screen where I could watch the procedure live. After some local anaesthesia in my right thigh, Ishikawa made a small incision and inserted a tube into my right femoral artery. Inside this tube, he inserted a series of smaller catheters that ran up towards my bronchial artery. From here, the current of the blood took them to smaller vessels aligning my left lung. Here, the master technician inserted tiny platinum coils to cut off circulation to the damaged blood vessels that were causing the bleeding. The operation is known as a Bronchial Artery Embolization (BAE), and Dr. Ishikawa is one of the world’s leading experts on the procedure. In fact, the Osaka-based doctor has designed and patented catheters bearing his name. About 20 minutes into the operation, I felt a strong pain in my lower back. I desperately needed to stretch or at least change positions, but I wasn’t allowed to move. The nurses came over and slid some cold compresses in the small space between my muscles and the table, which helped alleviate some of the discomfort. The procedure itself didn’t hurt very much, except when they inserted the contrastive agent into the arteries surrounding my chest. Three hours after starting, the surgeon signaled the end of the operation, and I was carted back to my hospital room with stern instructions not to move for another 5 hours. The muscle pain in my lower back intensified, but there was absolutely nothing that could be done about it except to bide my time until 5:30pm. Lunch was served at my bedside, but I wasn’t allowed to sit up or even lift my head. Kanako spoon-fed me like a child as I struggled to chew my food without choking on it. Swallowing proved more cumbersome, as the food seemed to stop short of my stomach and gather at the bottom of my esophagus like a poorly-designed septic system. I gave up on food after a few mouthfuls and retreated to the comfort of my I-pod. Music was the only way to forget about the paralyzing pain shooting through my back muscles. Around 5pm I gave up and secretly thrusted my arms beneath me, lifting up my body like a clumsy gymnast. I counted down the minutes as if waiting to open a birthday present at midnight, and at preciously 5:30pm, I rang the nurse call button and braced for the inevitable. “Oh, it’s 5:30 already”, she exclaimed, before grabbing the tube levitating between my legs. The removal of the bladder drainage mechanism wasn’t nearly as traumatic as the insertion: painful it was, but it was over in a instant. I slowly sat up, being careful not to pull a back muscle in the process. The back pain eased, and after 20 minutes of walking, gentle massaging, and slow stretching, I was pretty much back to my normal self. Dinner was served at 6pm, devoured at exactly 6:01pm, and I drifted off to sleep before the nurse could come back and remove the tray. Two days later I was released from the hospital, where the real recovery began. 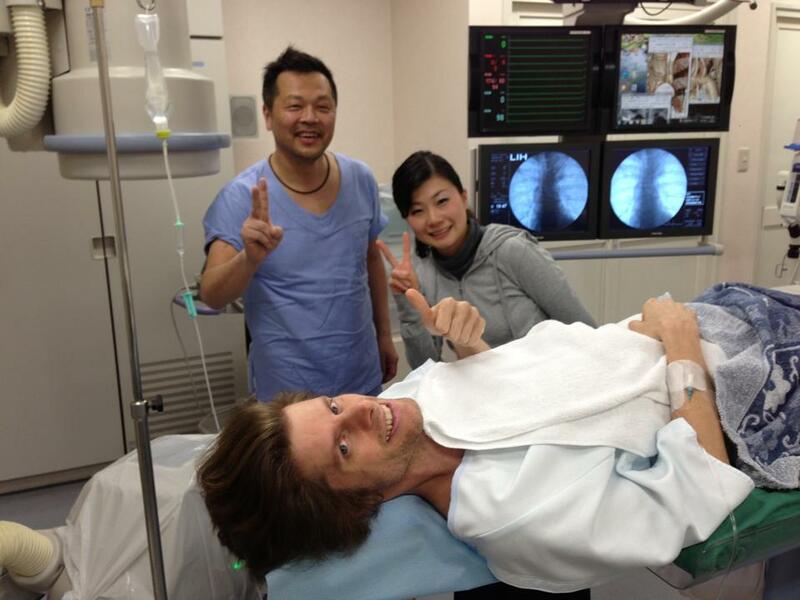 Dr. Ishikawa reassured me that the chest pain would ease after about a week and he was right. What I didn’t know is how unbearable the pain would be at times, and the sharp jabs kept shifting. One day I would have agonizing pain the minute I laid on my back and exhaled, while the next day sitting up straight nearly had me in tears. My energy levels have slowly returned, but the 3km I lost in the hospital has not. I’m not coughing up any more blood, but the cough does remain at times. I think I am finally ready to embark on a short hike to test out my lung capacity and to begin rebuilding some of the muscle tone I have invariably lost after spending a month without exercise. The distress call was put out at 5:23pm, but it took the ambulance nearly 10 minutes to come. As I sat there, spitting my insides into the plastic bag, I wondered about the cause of my internal bleeding, and if I’d even be able to see my wonderful wife again. She was in route but it would take her over an hour to arrive, so I would tell the ambulance driver to relay the hospital information to her so we could meet up later. When the ambulance staff entered my apartment, they seemed taken aback by the pond of tomato-sauce colored fluids floating on top of my garbage pile. They escorted me to the awaiting car, took my vital signs, and started searching for a hospital that would accept me. In most countries, trained paramedics take care of patients while ambulance drivers whisk victims to the nearest hospital in a matter of minutes. Not so in Japan. The staff started by calling all of the hospitals I had “membership” cards for: hospitals that I have visited in the past that have my information on record. I’m the unofficial king of ambulance rides, having been taken to hospital at least a dozen times over the last 6 years, so I know the procedure. Fortunately my bleeding had stopped but I was still coughing up a lot of phlegm. Since Feb. 11th was a National Holiday, a lot of doctors were not on staff, limiting my choices of available care. I needed to see a respiratory specialist, but every hospital in Osaka city turned us away, since they had no one on staff. While searching for a place to take me, I was texting Kanako, who finally arrived back at our place and joined me in the ambulance. 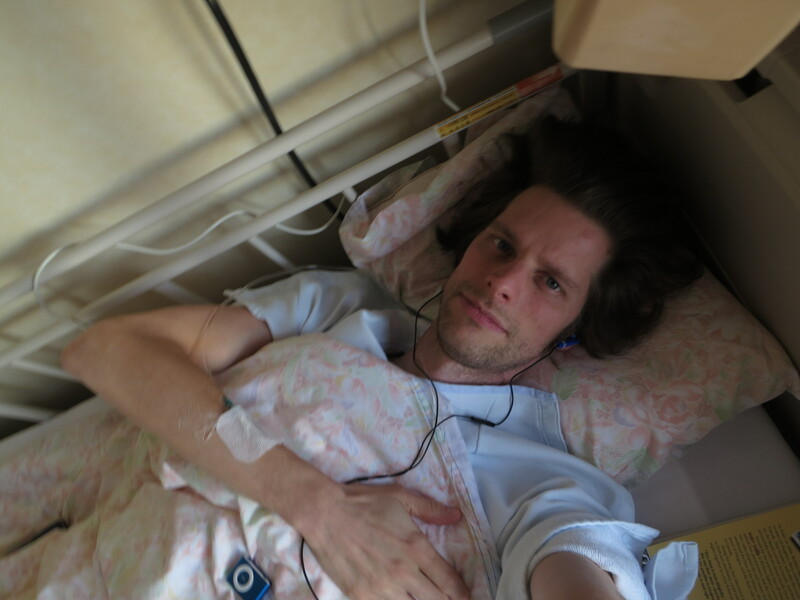 A hospital in Takatsuki (a 30-minute drive from Osaka) agreed to accept me, but the ambulance drivers weren’t enthusiastic about taking me all the way up there. They decided to first take me to the Osaka Central Emergency Medical Clinic, an off-hours alternative to hospitals located a few blocks from where I lived. I’d get to see a throat specialist first to make sure the bleeding was coming from my lungs and not from my throat. The ambulance staff wheeled me into the clinic, which was filled to the rafters with influenza-stricken children. There were more germs floating around here than in a scientific laboratory. They handed me off to the nursing staff, where we waited our turn to see the doctor. About 45 minutes later, I finally got a chance to see the specialist, who shoved a camera into my nose and down my throat. “It’s all clean”, he said, which confirmed my initial suspicions that my lungs were the culprit. He sent me across the hall to Internal Medicine, where I waited another half-an-hour before seeing the overworked physician. He ordered an x-ray and sent me to the other side of the clinic to the X-ray technician. I’m not sure if it was the deep breaths, the radiation exposure, or just incredibly strange timing, but as soon as the images were taken I started throwing up blood again. The technician let out a gasp and sent me back across the hall to the doctor, through the lobby of awaiting patients. Kanako’s look of horror intensified as she saw how much blood I was spitting up. The nurses grabbed me and thrust me in front of the doctor, who ushered me into a private room away from the other patients, who by now were staring in shocked disbelief. The nurses came over and provided towels while my physician got on the phone, trying to find a hospital that would accept me. It was round 2 of our ridiculous debacle. The initial ambulance drivers had definitely weaseled their way out of the situation by abandoning me at this godforsaken clinic. The bleeding stopped again but erupted once more about 20 minutes later. This time I soaked the bed sheets and even had blood coming out of my nose because I was coughing so violently. Kanako and I started yelling at the nurses, and the doctor abandoned all of his other patients to assist. He got back on the phone, this time calling some of his personal physician friends for advice. 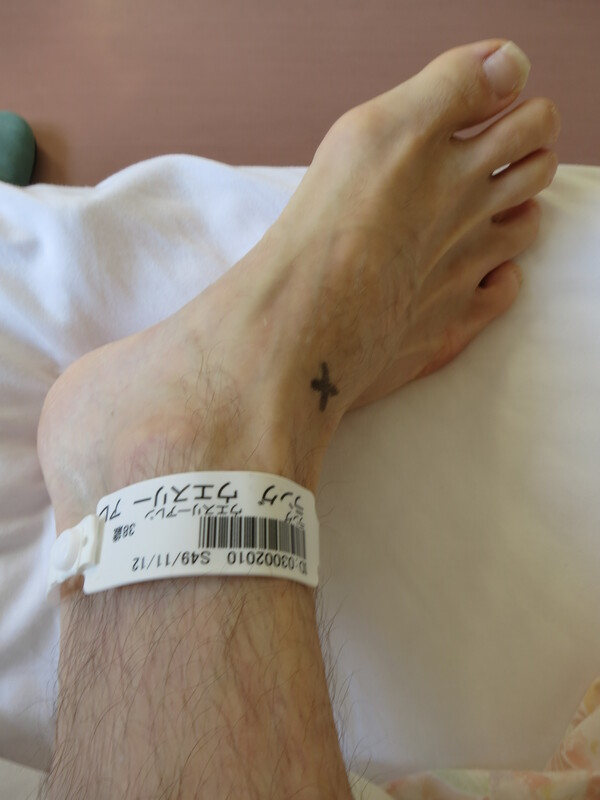 They hooked me up to an IV to help stop the bleeding, and we finally connected with a hospital in Kishiwada city (a 30-minute drive south of Osaka) that would accept me. The doctors told me that if they couldn’t find a hospital for me then they would have no other choice than to send me home. I wanted to go to ANY hospital in Kansai, but the system doesn’t work that way. Osaka ambulance drivers are not allowed to cross prefectural borders. Even if there was a hospital in Kobe or Kyoto that would accept me, I would have no way of getting there unless I jumped on a train, crossed into the prefecture, and then called the ambulance. The ambulance came and rescued me from the clinic at 11:30pm, preciously 6 hours after I had initially called for assistance. Japan’s emergency network works wonderfully if you follow two very important rules: 1) Don’t get sick on a weekend. 2) Don’t get sick from something that needs a specialists care. Broken bone? The Flu? No problem. A heart attack or cerebral hemorrhaging? Call the priest. 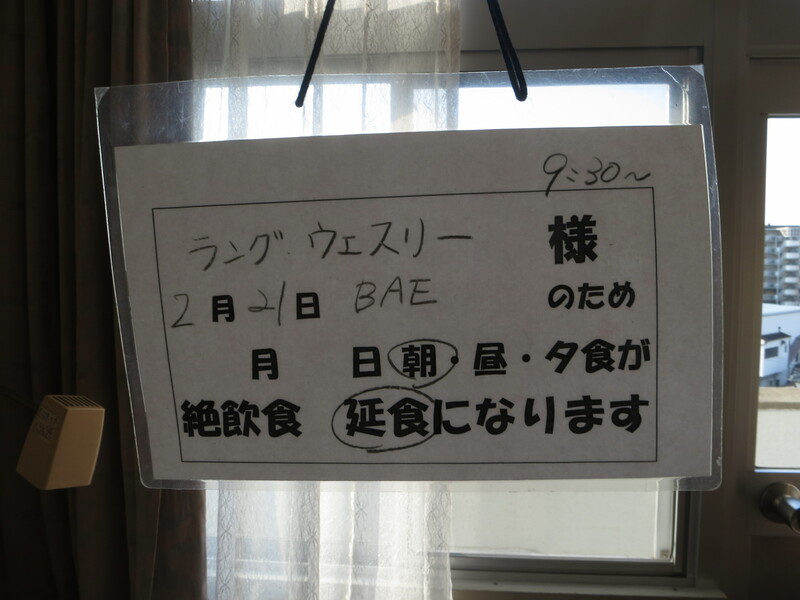 I arrived in Kishiwada and was immediately taken to my room, where the tests commenced. I had a CT scan to determine the cause of the bleeding, and a short time later a doctor came in to meet with me. He basically told me the main doctor wouldn’t be in until Tuesday, and that I could remain her for the remainder of the weekend in case my condition deteriorated. Phew, it looks like I would live through this one, at least for the time being. I’m really starting to think I should rename this blog the QQ Tales after the Japanese word for emergency,　救急 (kyuukyuu). After my brush with death at the beginning of January, I thought I could focus my energy on overcoming my newly-found fear of winter mountaineering and plan some rewarding hikes for the upcoming spring. Alas it was not to be. Sunday the 10th of February started off like most Sundays. A late lie-in followed by a simple breakfast before heading to one of my usual haunts for a leisurely lunch. Afterwards, I settled down to work, chipping away at a few writing projects and programming my new GPS device for a Monday hike into the Rokko mountain range. Like most lazy weekends, I headed to bed shortly after 5pm for a quick power nap to give me a boost of energy for cooking a hearty stew for the next day’s hike. Immediately after lying down, I started to cough. This is a regular routine, as I usually cough when heading to sleep. Sometimes the cough is gentle, while other times I heave violently for a short time before the muscles relax and I drift off to sleep. My chronic cough is dry, unproductive, and the result of years of battling allergies and asthma. Several strong spasms swelled from deep within my diaphragm, which somehow set off a bizarre chain-reaction of events. In the blink of an eye, my dry cough quickly became wet, as I could feel the liquid move smoothly across my entire chest cavity. I haven’t had a smooth cough like this since I was a child, as the ease of movement of phlegm felt so relieving after years of not being able to eject much sputnum. While still on my back, I grabbed a tissue from a tissue box I handily keep by the side of my bed and spit out a large amount of warm phlegm that had collected in my oral cavity. The tissue turned bright red, as if I had just placed it on a gaping wound. I jumped up from bed, ran over to the sink, and vomited a cupful of fresh hemoglobin into the sink while continuing to cough violently. Running back to the bedroom, I grabbed my cell phone, called my wife, and quickly and efficiently explained the situation. If I passed out before making the emergency call, at least my wife would know the reason. I headed into the dining room, pulled a trash bag close to my seated torso, and dialed 119, somehow managing to logically convey my vital information despite my lethal expulsion of plasma. With the ambulance in route, I clumsily gathered my belongings and sat at the entrance of my apartment, door propped, in case I should lose consciousness before help arrived.